Sample battery charger in ferroresonant technology. Building reliability into the design of emergency generator systems is a common theme across NFPA requirements. Along with my earlier articles on “Key Components of a Mission-Critical Facility”, this article will focus on the battery charger, and the available technologies and features that can increase the reliability of your emergency generator system. If you have experience with emergency generators for backup power, you may be aware that a “no-start” failure is one of the most common reasons for generator system failures. A “no-start” failure simply means that the engine-generator failed to start when called to do so. While “no-start” failures are often attributed to failed batteries, the battery charger can sometimes be the silent culprit. A battery charger is tasked with maintaining batteries in their charged condition, so they can support the engine start cycle when needed. Seems simple enough, but did you know that there are several types of batteries, each with unique charging characteristics? A battery charger that is not tuned to deliver the correct charge profile to a given set of batteries can lead to overcharging or undercharging issues. The most common signs of improper charging of a battery can be seen by excessive sulfating and loss of electrolyte. These failure modes also happen to be the most cited causes for failed batteries. See the connection? To avoid shortening the life of the batteries, it is critical that the battery charger be selected in close coordination with the connected batteries. What is the preferred battery type for the project? The most common battery types are lead-acid and nickel-cadmium (Ni-Cd). These terms refer to the materials used in the battery’s cell construction. Lead-acid batteries can be of the flooded type (furnished with removable vent caps to replenish the electrolyte), or the valve-regulated lead-acid (VRLA) type. VRLA batteries use electrolyte but do not require electrolyte replenishment. They are often called “sealed lead-acid” and “maintenance free” (although they are neither of these things). Nickel-cadmium batteries use potassium hydroxide as the electrolyte, are more expensive than lead-acid batteries, but they benefit from a longer life expectancy and a more predictable end-of-life. Identifying the battery type is important because not all battery chargers can charge all types of batteries. For example, nickel-cadmium batteries require a different charge voltage than lead-acid batteries, and some chargers cannot be set to the required float voltage rate. Another example applies to valve-regulated lead-acid batteries, which are more susceptible to voltage ripple than the standard flooded lead-acid types. So, a battery charger proposed for VRLA batteries should have a filtered output (with lower ripple) to avoid damaging the batteries. Where is the installation located? Battery chargers receive power from the local utility and convert that power to a DC output to charge the batteries. Some locations may have loose tolerances for voltage and/or frequency. Some battery charger technologies are better-equipped to manage lower-quality power sources, while still providing an appropriate output to charge the batteries. Will the battery charger be required to carry an electrical load, in addition to charging the batteries? For example, will the charger be powering miscellaneous engine control loads, or switchgear devices, while at the same time charging the batteries? If so, the battery charger selection must account for these continuous electrical loads. Are electrical efficiency factors, physical size and weight important? There are battery charger technologies that offer smaller size/weight, and higher power factors (although these benefits sometimes come at a cost; see table below). What are the expectations for the equipment’s longevity vs. cost? Price is always important, but a charger than can last 20 years in operation may be worth every penny. With answers to these questions, you can now proceed to select a battery charger that will optimize the operating life of the batteries. Below is a table with the various battery charger technologies, and their key features. As is often the case, you may find that a trade-off will be necessary when choosing the best possible solution. Identify the DC voltage output (to match the battery system voltage), and the charger’s current rating. For help in selecting the current rating, you can use this simple tool. Identify and specify the power input voltage for the charger (120Vac 1-phase, 208Vac 1-phase, etc.). Specify any alarm parameters that require monitoring (loss of power, low output voltage, ground fault, high output voltage, etc.). At a minimum, your battery charger specifications should require compliance with NFPA-110. If applicable, specify any communications requirement for interface with building management systems or SCADA systems. Chargers are available with various communications protocols such as SNMP, Modbus and DNP3. Review the product data sheet for the battery charger being considered, and specify any optional features required for your project. Line and load regulation – the battery charger can maintain a regulated output while accepting wide variances on its input power. This is important for locations with poor power quality from the local utility. Self-diagnostics – this feature allows the battery charger to identify an internal fault, and shift to a “limp-mode” that allows continued operation (albeit with reduced performance). Temperature compensation – batteries are very sensitive to extreme temperatures. A battery charger equipped with a temperature probe can monitor the temperature surrounding the batteries, and adjust the charge rate to avoid overcharging or undercharging a battery. Monitoring battery electrolyte level – identifying low electrolyte levels can be a great tool in protecting a battery from being overcharged and “boiled” to failure. Much more than just indicating low electrolyte levels, a modern battery charger will automatically disable its “equalize” function (high current rate) to not aggravate the problem. Battery test – a battery charger can issue a simple “continuity test” to the batteries, to identify an issue before it becomes catastrophic. 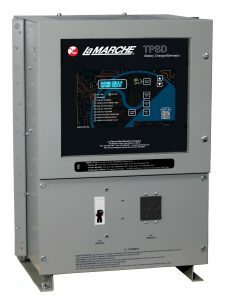 Even more, a modern battery charger can log and compare current and past charge cycles, to alert of a battery system that is degrading over time. If your emergency generator application is of a critical nature, I encourage you to reach out to your local battery charger sales representative for help in selecting a battery charger that is tailored to your needs. Today’s battery chargers are packed with smart features that can be leveraged to deliver an emergency generator system that will be ready to start when needed. What’s the Difference Between Exhaust Flex Connectors and Bellows?